David Lloyd George, 1st Earl Lloyd-George of Dwyfor OM, PC (17 January 1863 – 26 March 1945) was the British Prime Minister during the last half of World War I. He was Prime Minister for six years, between 1916 and 1922. Lloyd George was born in Chorlton-on-Medlock, Manchester, Lancashire, England to Welsh parents. His father, who died before Lloyd George was two-years old, was a teacher and a farmer. When he was young, he lived with his mother and his brother. When he was 21, Lloyd George became a lawyer and opened an office in the back of his brother's house. Lloyd George's law practice was a success. Shortly after opening it, Lloyd George became interested in politics. He began working with the Liberal Party. He was elected as a Member of Parliament (MP) on 13 April 1890. Lloyd George would serve as an MP until 1945. In the House of Commons, Lloyd George worked to promote Welsh issues, fought against the Second Boer War and campaigned for education reform. In 1905, Lloyd George was selected to become a cabinet minister. He served as President of the Board of Trade (1905–1908) and Chancellor of the Exchequer (1908–1915). After World War I started, he held the positions of Minister of Munitions (1915) and War Secretary (1916). By the end of 1916, the war was going badly for Great Britain. Lloyd George gathered together a coalition (a type of political team) of Liberal and Conservative MPs to form a new government. On 5 December 1916, Prime Minister H. H. Asquith resigned, and Lloyd George took his place. 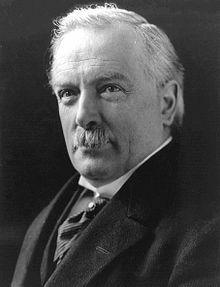 Lloyd George's government introduced conscription (forcing men to join the armed forces) and rationing (placing limits on the amount of food someone can buy) by the end of the war. After the war, Lloyd George represented Britain at the Versailles Peace Conference and helped create the Irish Free State. By 1922, Lloyd George's coalition was breaking apart. In October 1922, the Conservative Party led by Andrew Bonar Law won the election. Lloyd George remained an MP, however, until 1945. In 1945, he was given the titles Earl Lloyd George of Dwyfor and Viscount Gwynedd. He was to take a seat in the House of Lords, but he died before he could do so. This page was last changed on 6 April 2017, at 00:19.